When it comes to laptops, thinner and lighter is usually better. After all, the whole point of the laptop is to be portable. This is something Asus seems to know quite well. The company’s recent lineup of ZenBook laptops seem to have taken this philosophy to heart. The new laptops are among the thinnest and lightest that the company has ever produced. Choice is something that is very important to a consumer. The new Asus ZenBook is available in three variants. The most compact variant is the ZenBook UX333 that sports a 13.3-inch display. The ZenBook UX433 sports a slightly larger 14-inch display, while the ZenBook UX533 features a 15.6-inch display. So you can pick one based on your needs and budget. The first thing one will notice about the new Asus ZenBook is its compact size.In fact, Asus says that it is the world’s smallest laptop. * The most compact version of the device (UX333) measures 30.2cm x 18.9cm in size which is smaller than an A4 size paper. The next in line UX433 measure 31.9cm x 19.9cm which is just about the size of an A4 size paper. Adding to its compact size is the fact that the ZenBook UX333 weighs just over a kilo. This means that the laptop should be able to fit most bags and you should be able to carry it around with little difficulty. *As of August 17, 2018 based on internal ASUS market analysis comparing ZenBook 13/14/15 laptop size to competing products in their class (laptops with a screen measuring 13.3 inches, 14 inches and 15.6 inches) from vendors including Acer, Apple, HP, Huawei, Lenovo, Microsoft and Samsung. Royal Blue or Icicle Silver? Taste and preference is something that varies from person to person. The ZenBook UX333, UX433, and UX533 are available in classy and chic Royal Blue and Icicle Silver colour variants. So, you can pick one that best suits your style. While the size of the new Asus ZenBook laptops may turn heads, the design of the laptop itself is quite subtle. In fact, the laptop would feel at home on the desktop without looking too out of place. The chic looks as well as impressive power of the new Asus ZenBook laptops also mean that they are well suited for anyone who needs a performance oriented laptop that they can use on the go. This includes professionals as well as students who may need access to powerful devices at all times. Of course, one might wonder how Asus managed to stuff relatively large displays in comparatively compact chassis. It did this by remarkably trimming the size of the bezels around the display of most laptops. The devices feature the NanoEdge design that feature very thin bezels on all four sides of the display. As such, you get a screen-to-body ratio of over 92% for all three devices. Another common thread between the three is that all come with a Full HD display with a resolution of 1920 x 1080 pixels. With compact laptops, there usually isn’t enough space to include a complete numpad. The new Asus ZenBook manages to go over the problem through a bit of ingenuity. The laptop features a NumberPad function that allows users turn the trackpad into a numpad. When turned on, an illuminated numeric keypad appears on the trackpad. This allows for a more compact design, while still offering a traditional numpad. While the new Asus ZenBook may features a very petite frame, it is designed to be surprisingly tough. Asus claims that all three variants of the laptop meet the MIL-STD-810G military standard for reliability and durability. 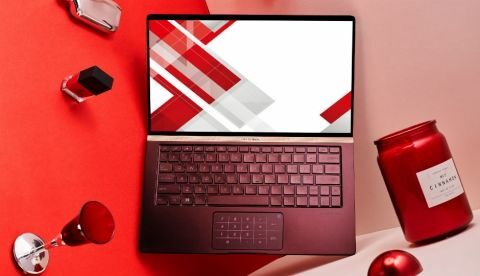 Further, the company notes that it has also passed its own internal laptop tests as well. So it should be able to survive the occasional bump or scrape.